Gorgeous graphics but gormless gameplay leaves you wishing you were playing any of the dozens of other games this indie dud attempts to parody. To summarize in a similar vein to Rise & Shine's humor: This game could have been a triumph, but then it took an arrow to the knee. The graphics make you think the gameplay cake is real, but the cake is a lie. All you'll find are Flappy Birds, a dead Princess Peach, and Marcus Fenix. But hey, at least you can kill the Duck Hunt dog, so that has to count for something. Oh, and this is the Dark Souls of video game humor. Take that for what you will. Rise & Shine tries to constantly use nods to other games, which is really repetitive sometimes. Good ideas on many occasions, but poorly performed in multiple times during its short duration. Fun but short action game that also has a great amount of puzzles. Its control it's not perfect when played with a controller, but that almost the only flaw. It’s full of blood, violence, puzzles, humour, all set in such a beautifully designed world. Definitely one of the most fun platformers of recent years. Rise & Shine is a run and gun 2D shooter that struggles to find its footing in game play and tone. Small issues can be found throughout the experience, but the difficulty and level design, in both variety and beauty, makes the experience worth a few hours of your time. Players who like tough games will love Rise & Shine, but it will never truly shine unless the developers rebalance the difficulty. With a playtime of around three to five hours (a chunk of it down to death-induced restarts), Rise and Shine mercifully doesn't outstay its welcome. Unless you're keen to replay the game on its unlockable permadeath Ironman mode - or hunt for a handful of useless collectibles - you'll have little reason to return to Gamearth. However, if you can tolerate/appreciate the hammy humour, there's a tight and often tricky adventure that delivers a decent, if fleeting experience. 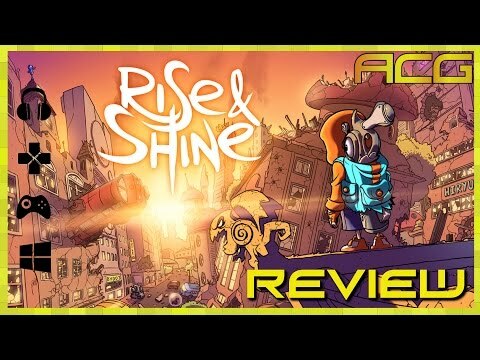 Rise & Shine is a good action-platformer though its main shortcoming is how short the game can be. Once you get the hang of things the game can be finished in a few hours, but if you’re looking for a challenge the game’s difficulty spikes about a third of the way in and it just gets harder from there. If you're up for a challenge, this is one to check out. Rise & Shine looked like an early sleeper for 2017, but its design holds it back more often than not. I wanted to love it, but after banging my head against it for the short duration it lasts, it wasn’t worth the tedium. the ability to make the gun point at the right spot is the difference between gaming nirvana and controller chucking rage. Go ahead and ask my controller where this experience leaned. It only took three hours to get through Rise and Shine in its entirety but it was an enjoyable experience. With beautiful visuals and some exciting boss fights, there's plenty of flash to get your attention. Rise and Shine is undoubtedly one of the best-looking games on the Switch. Rise & Shine isn’t the deepest action-platformer you’ll ever play, but the tongue-in-cheek nods to the gaming industry at large, along with its stunning art style, will push you to the finish line even when the gameplay starts to let you down. Rise & Shine reminds us of the visual style and of the gameplay of Metal Slug series. It's hard, fulfilling and funny, but it suffers also from a lack of game contents. Rise & Shine feels like a game that tries too hard to be too much, ultimately coming together in a fun package that could have been great. The action is tight and rewarding, the gameplay is varied, and the difficulty is satisfying, if a bit frustrating in some parts. Fans of old-school arcade shooters will find plenty to love here, even if the jokes don’t always hit home.